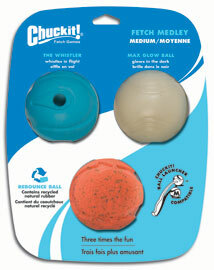 Chuckit Fetch Medley is a variety three pack of rubber dog balls containing Whistler, Max Glow Ball and Rebounce Ball. All three dog balls are Chuckit compatible. The Whistler whistles in the air, Max Glow Ball is a glow in the dark dog ball and Rebounce Ball is bouncy fun made from recycled rubber. They are all natural rubber and easy to clean. Durable, tough dog balls. Variety is the spice of life. Chuckit balls are no ordinary dog balls. 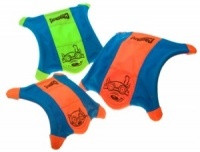 They are designed for the most demanding use without spoiling the fun. Available in size Medium 2.5" 3-pack. 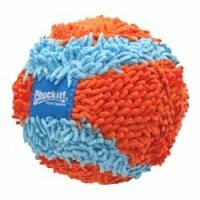 All great dog balls in their own right but also Chuckit ball launcher compatible for amazing games of fetch. If buying Fetch Medley for a ball thrower, please check our size compatibility guide below. Lucy loves everything about the Chuckit balls. As soon as she see's us pick them up she starts shivering with excitement. She has become an expert at catching them on the bounce, and in the recent glorious weather has taken to throwing them in the river and then diving in to get them. Like any ball though, a nightmare to find in long grass! When I could no longer buy my dog's favourite balls I was devastated, he is so particular! Then I saw the 'Chuckit Fetch Medley' OH!! He LOVES them! During the day we play with the whistler and the blue one and then for his last play before evening we play with the glo ball - A GREAT SUCCESS, one DELIGHTED DOG and OWNER! Great products. Shame I keep losing them. My dog just loves these balls, annoying when they get lost in field so order regularly! The best!!! Once again these bouncy balls have defied the jaws of my most ardent destroyer of all balls!!!! Highly recommended and I have ordered the squeeky version. Cannot buy enough of them. These are the best balls that I have purchased, my Border Collie loves them so much, the whistle ball is great, he never looses that one, today was the 1st time I took the glow in the dark one, as it was such a dark morning, he never lost sight and always brought it back to me, not tried the rebounce ball yet, that might just be the one to try for this afternoons walk., overall these are the best balls I have ever bought. Have to say that I love these balls! The glow in the dark one is wonderful for when it starts to get dark (which is happening sooner and sooner.) the fetch one makes a nice whistle when thrown, and the rebounce one deffo lives up to its name, lol! My ball obsessed girl loves that one the most out of all 3. But yeah, it's great for dogs and teething pups. Not one dent and the pup chews them a lot! You couldn't go wrong with chuckit balls. these balls are funtastic. my missy a border collie x german shepherd is a ball chasing nut and she has great fun jumping up to catch them. the glow in the dark one is now our night night ball. we have great fun playing catch in the dark. only down side is they dont float..
106 of 106 people found this review helpful.